The car then ran as a vintage race car for years in the US and was repowered with a BSA engine rather than the original Velocette engine. The car runs but needs fettling to race as it has been off the track for a few years. Buyer may wish to restore it back to original with a Velocette engine. Offers around $19,000 US dollars. This car was built for an Irish racing drivers’ school and spent its early life in Eire and Northern Ireland until imported into New Zealand as a derelict in 1986. 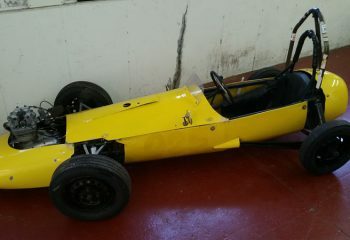 It is one of two known Cooper Mark 2 Formula Juniors utilising a Renault gearbox. The Irish Customs’ import papers are still with the car. A six-year rebuild was completed in 1992. 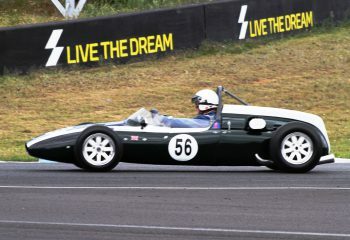 The car has been restored to its original 1961 specifications and is in possession of a Motor Sport New Zealand Category A (original specification) Certificate of Description. This car has no known chassis number but has been verified as genuine by the UK-based Cooper Car Club who numbered it as FJ/27/61. A list of previous Irish owners has been compiled for it by Northern Ireland’s foremost motorsport historian. 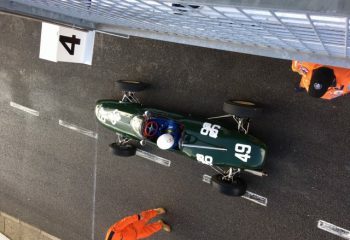 During its life in Ireland this Junior ran Coventry Climax and supercharged Ford engines on Lotus wobbly web wheels. It finished its life in Ireland as a rally-cross chassis. The car has been in one family’s ownership for the past 33 years and has run virtually trouble-free in New Zealand historic racing events plus two trips to Australia in that time. It has never had crash damage. The car currently runs a legal spec 998cc (+40) BMC A-series engine and Renault Dauphine Gordini four-speed gearbox. A similar specification 1098cc engine and Renault gearbox are with the car as spares. Other spare parts include two original magnesium wheels (and wheel casting patterns), brake shoes, drums, wheel cylinders and backing plates; starter motor. Two engine blocks and a 12G295 head casting. The complete package is priced at GBP85,000 delivered to the port of the purchaser’s choice. Expressions of interest are welcomed to garmey@xtra.co.nz Telephone +64 9 298-0599. Winner of 1977 Italian Formula 3 Championship. Finished second at Monaco in 1977. 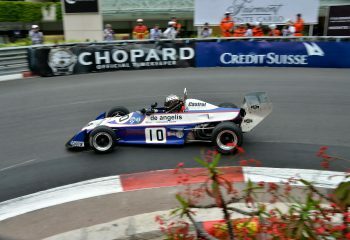 Winner of 1978 Monaco F3 race. Also driven by Carlos Reutemann who tested and set up the car at Fiorano prior to the win in Monaco in 1978. Very original car with superb detailed history and provenance. Professionally prepared by Tom Denyer Racing. The Chevron still retains the original tub as raced by Elio complete with the odd minor battle scar as you would expect from a 40 year old original race car, but is completely straight and well maintained. There is an interesting connection to the kidnapping of Elio’s father in Sardinia and his subsequent release brokered by Don Sergio Mantovani the parish Priest of Modena which is detailed on extensive story board that comes with the car. 3 Participations in Monaco Historique Grand Prix and almost 100% certain entry should Formula 3’s be invited to participate again. Good spares package including 3 sets of wheels, brand new wets and one race old slicks. Accepted entry for 2019 Silverstone Classic, Oulton Park Gold Cup and FIA Historic F3 European Cup Masters at Zandvoort. An opportunity to purchase a Junior project. The car was restored in Australia in 1999 used frequently then dismantled and shipped to the UK. It has since been loosely assembled and all parts appear to be present. 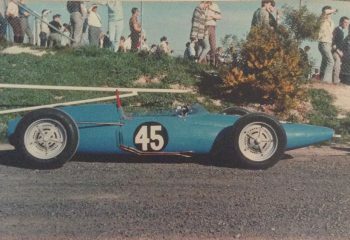 Lynx engineering in Australia began manufacturing Formula Junior racing cars back in 1961 having acquired the patterns and jigs for the early Ralt cars from Ron Tauranac when moved to England to work with Jack Brabham. Lynx built approximately 20 cars during 1961 and 1962. Chassis FJ104 was completed 27/4/1961 as a rolling chassis and purchased by the service manager for Repco. He installed a BMC A series engine and VW transmission. The engine was originally 998cc but subsequently bored to 1074cc. The history of the car is basically complete with period photographics, letters from previous owners, historic classified adverts for the sale of the car, CAMS documents, history of Lynx cars and race programs etc. The original VW gearbox appears to be in excellent condition. The engine will need a complete rebuild depending on the specification you desire but it comes with the correct BMC/VW adapter plate, rare Lynx rocker cover and Lynx inlet manifold together with Weber carb. This is a rare Formula Junior and as such would be an ideal candidate for entry into the prestige events. Raced with Formula Junior since. 2018 Prepared and raced by Finburghs, new belts extinguisher, tyers, master cylinders. Brake callipers rebuilt, all fluids changed, general tidy up and suspension check set up. Complete restoration has been carried out over the last 2/3 years and it’s ready to use immediately. Tub reskinned, restored, painted and new fuel tanks installed. All suspension components are new including uprights, bearings, wishbones, rose joints, dampers etc. All new instruments, battery, fire extinguisher and seat belts. New Chevron pattern wing and wing frame. All new nuts bolts, hardware. New Berazzi knock on Chevron wheels (slicks) and original magnesium wheels (wets). Torque wrench included to remove and install wheels. Richardson Alloy Block BDG 8mm fuel injection. Has only covered 150 miles since rebuild by them. FT200 rebuilt by Tony Wilson and has had very little use and substantial number of spare ratios included. 2 Spare radiators, spare body top, spare seat. Chassis dynamics analysis undertaken by GSD Racedyn (Nigel Rees). The car is extremely light and significantly under the weight limit. The history of this car is not definitive however evidence suggests that it is B25/73/07 – the Peter Gethin factory car. Original bodywork which accompanied the car revealed the works livery and there is correspondence which comes with the car referring to it as #07. This is an excellent opportunity to purchase a front running Formula 2 Chevron which requires no expense and can be used straight away. I have raced it once at Spa Peter Auto F2 in 2017 and HSCC F2 Silverstone 2018 – 4th place finish from back of grid. The car is extremely easy to drive and in the right hands has the potential to win in Historic F2. Its permitted under the regulations to run at 450Kg instead of 500Kg which the post 73 cars have to, resulting in a significant weight advantage of 50kg with no real power deficit to the BMW/Hart powered cars and the added reliability and spares availability of Ford BDG. 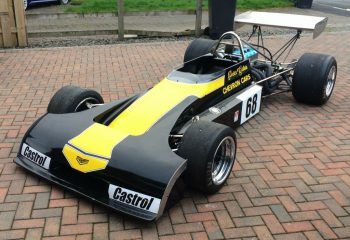 Eligible for HSCC Historic F2, Derek Bell Trophy and the standalone Historic F2 race at Silverstone Classic in 2019. Phone James on 07753684824 or email jmm25577@googlemail.com for further info.